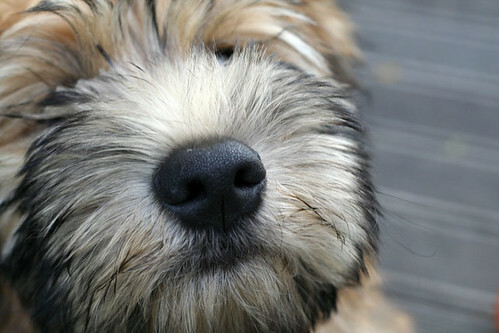 Oh my gosh, dogs noses are just the cutest things ever. You need to scrap this picture!!!!!! Have missed your blog, twas so excited when I originally found it - quilting, knitting and digi scrapping, does life get any better??? Glad to see you blogging again. Ohhhhahhh a second posting - good thing i looked as I was going to use digi links - don't know why I just don't add them to my faves but I guess I like going thru your blog and occassionally finding you have written something. Cute dog - shame bout the mayhem he has caused you. Heal quickly. What a great photo. I wonder if that's how that entire series of dog shots with the big noses got started - by a 2 3/4 year old photographer. What a fab picture! I think you have a budding artist on your hands. Oh! I want to grab your puppy up and take her home! Sooooo cute! Want to see more pictures! !